We do not inventory (and never have) unfigured North American hardwoods. We travel far and wide to select individual logs and carefully grade each board. Multiple lumber sorts by width, length, color, NHLA grade and, most importantly, INTENSITY OF FIGURING to better MATCH YOUR EXACT NEEDS. In this era of just-in-time inventory control, the steadfast, long-term policy of Spectrum Hardwoods has always been to hasten slowly. We hasten delivery to meet your immediate needs, yet we Age our woods slowly. All Figured Woods have been aged for at least one year after kiln-drying before being made available for sale. Internal tension of interwoven grains is consequently reduced. Equilibrium Moisture Content is stabilized and internal stresses are relieved. The result is less movement upon resawing, ripping, and processing and, most importantly, less movement in service of the final product. TREAT YOURSELF to the Affordable Beauty and Timeless Elegance of HIGHLY-FIGURED HARDWOODS. TRY the fascination of highly-figured woods in your projects and products. ADD another dimension to your designs with 3-Dimensional Figured Hardwoods from Spectrum Hardwoods. Probably the most breathtaking density of birdseyes is to be seen in the heartwood of Birdseye Maple. Birdseye almost always grows from the pith to the cambium- that is, from the center to the outside of the tree. Imagine the spokes on a bicycle wheel as the end of a top-quality birdseye maple log. Now imagine making the round log into a square cant (99.99% of hard maple is cut flat-sawn). 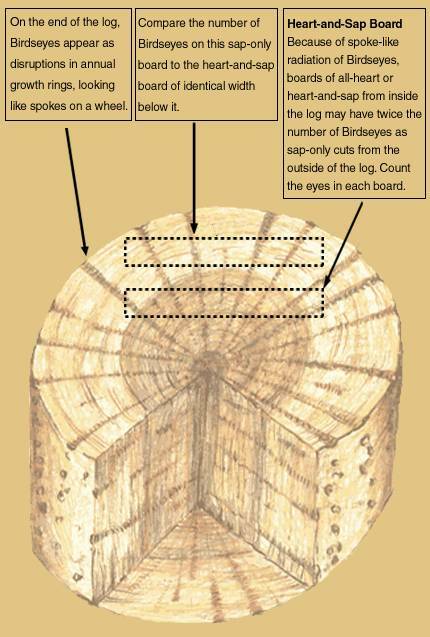 The closer the board is sawed to the center of the log, the more dense the birdseyes. Boards cut from near the center of the log that exhibit both heart-and-sap (dark and light) color with high concentrations of birdseyes can be visually spectacular. If you wish your final products to feature the intrinsic character, variation and dimension of birdseye as design elements, you might consider using such multi-colored, heart-and-sap birdseye wood. Consumer, even connoisseur, tastes in exotic woods have changed over recent years. The trend is away from the homogeneous "formica" look and toward the variegated. For instance, high-contrast, striped Macassar ebony is in high favor. As another example, gunstock aficionados desire English, Claro, etc. walnuts that feature marblecaking and a variety of colors instead of steamed-the-same-color, drab eastern walnut. Resawing Heart-and-Sap Birdseye will yield a visually-stunning and distinctive mirror-match. This 'Rorschach test' look can also be emphasized in your products and designs. Heart-and-Sap Birdseye- the highest concentration of eyes in North America's most prestigious hardwood. Demonstrating a rare depth and dimensionality, Fiddleback Maple is one of the world's most-prized hardwoods. The Fiddleback Maple figuring is occasionally found in other hardwoods, including walnut, koa, ash and, rarely, other domestic and imported hardwoods. Fiddleback Maple is also known as 'Flame Maple', 'Tiger Maple', 'Curly Maple', or 'Tigerstripe Maple'. Fiddleback Maple exhibits a dramatic change in the individual stripes or lines. As the incident angle of the light is slightly altered, the dark stripe becomes a light stripe, and the light stripe becomes dark. This visual phenomenon is known as 'chatoyancy' in the gemstone world, and its most dramatic form is seen in catseye chrysoberyl. True Fiddleback figuring is not to be confused with "compression grain" or "stress grain" found where roots merge into the bole and also on the underside of large limbs. Some differentiate between Curly and Fiddleback figuring. For instance, curly cherry and curly birch can exhibit much swirls, waves and curls, though they are far more irregular and large, often appearing as flattened arches stacked one on top of another over the length of the board. 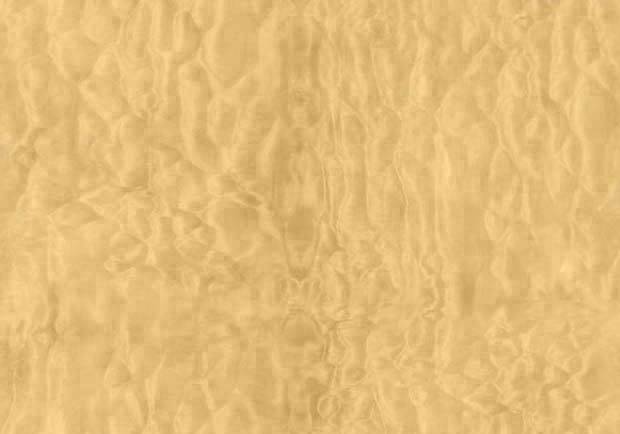 Fiddleback Maple (Flame Maple, Tiger Maple) grain is generally considered to be more pronounced with tighter striping, sometimes measured as tight as several stripes per inch. Unlike many forms of curly grain, Fiddleback describes a series of tight, parallel (or nearly parallel) stripes running perpendicular to the length of the board. In the United States, most use the terms Fiddleback Maple and Curly Maple synonymously. Fiddleback Maple boasts a three-dimensional series of alternately bright and dark stripes that shade into one another as the wood is slightly moved, thus producing an illusion of actual waves. Changes in brightness result from differential light reflection. Relatively high absorption by exposed fiber ends produces dark bands; reflection and diffraction from fiber walls cause bright bands. Because the fiber walls are curved sharply and act as concave or convex reflecting surfaces, any change in angle of view or incident light makes the apparent waves seem to shift. Again, the same light stripe becomes a dark stripe and vice-versa. The illusion of undulations results from regular and repeated, parallel, wavy lines that produce an interference pattern on the exposed plane. Modern botany and science still cannot adequately account for what exactly causes the visually-stunning figuring in Fiddleback Maple (also known as Flame Maple, Curly Maple, Tiger Maple, Tigerstripe Maple). In conclusion, then, the cause(s) of the rare figuring seen in Fiddleback Maple is yet unknown. The mystery of Fiddleback Maple, in spite of electron microscopes and huge advances in the fields of wood technology, plant genetics, etc., for now remains unrevealed. While the precise cause of the Mystery of Fiddleback Maple must remain, at present, unknown, the result is well-known, greatly esteemed, and eagerly sought by wood aficionados as Fiddleback Maple- one of the world's most transfixingly beautiful exotic hardwoods.